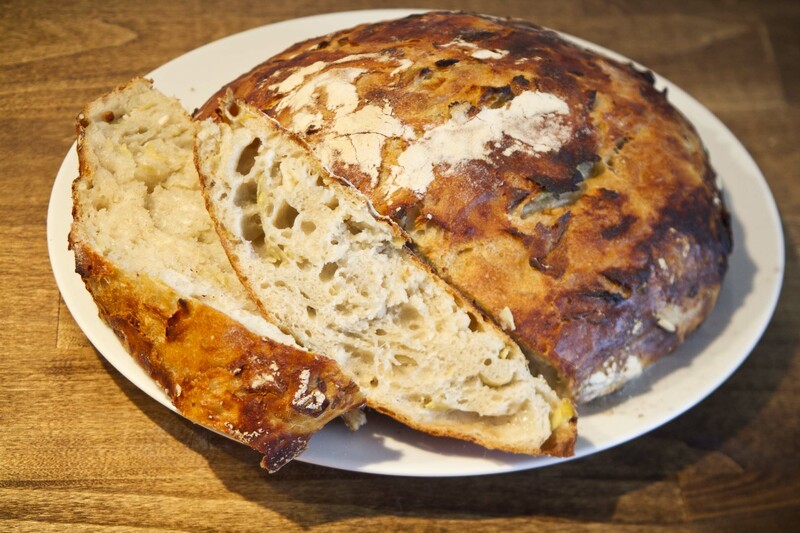 This entry was posted in Food Blogs, Recipes, Virtual Vegan Potluck and tagged artichoke, artichoke and roasted garlic bread, bread baking, dutch oven, easy bread recipe, homemade bread, no knead bread, proofing, roasted garlic, savory, steam baking, virtual vegan potluck, yeast. Bookmark the permalink. As a serious bread fan, I think I am in love! I can’t wait to try this one, thank you for sharing! Oh, I love the idea of a long-rising bread. This looks so good, I could probably devour that entire loaf! I’m going to try this one for sure! Thanks for sharing! That’s a beaut, Kathryn!! So crusty! Thanks Annie! It was a yummy loaf for sure 🙂 Glad I could take part in the VVP again! I bet! I haven’t gotten a chance to go through all the recipes yet, but I’m looking forward to it! Thanks for stopping by! Oh, this looks amazing. I love crusty bread but have never known how to get it ~ now I’m set 🙂 And the artichokes, roasted garlic, and adding some kalamatas…perfection! The steam really does help! I’ve wondered that for a while too, but after trying the steam for the first 10 minutes of baking it really improved the crust! I love no knead bread! Your crumb looks all airy and amazing! Wow, I can’t imagine a spot in my kitchen which would stay warm enough for 20 hours for bread to rise! Sounds challenging! It just has to be room temperature, so not too hard 🙂 I didn’t do anything in particular to keep it warm and it rose just fine. I wouldn’t put it in a cold spot, but room temp is fine. Yay no need to knead. Ooh I never baked a bread that took 16 hours to rise give me artichoke and garlic and I would be happy to wait for it’s inherent goodness and aroma. This is wonderful. I’m going to try it with my starter and see how it goes. I love the idea of adding the roasted garlic. It is torture to wait this long for the bread to proof, but it is so worth it. I usually use my sour dough starter, but I am keen to see the difference if I use instant yeast. Thank you for a really great recipe. Wow! What a great crust on that bread! I will pretty much put artichokes on anything I can but never thought to put it in the bread. The crust did turn out well, thanks! I will definitely be using steam while baking from now on. I love artichoke tapenade on bread, so I thought why not bake the artichokes right into the bread? I would never have thought to try artichokes in bread – brilliant! Wow, this bread looks amazing!! It has all of my favorite things in it, especially if you add in the option of adding olives. It sounds incredible! Thanks! I think I will definitely try it with olives next time. It just seems like the natural compliment and I love olive bread! This bread and a glass of merlot..yummy!!! Definitely! That would be a great pairing! The crust looks beautiful. I bet this is incredible warmed with some some butter, yum! That looks lovely! I can’t believe that is a no-knead bread. The crust it gorgeous! Love the combo of artichokes and roasted garlic in a bread! Delicious! Wow, what an interesting bread! I can’t believe it takes so long to rise, but it must make for some amazing bread. 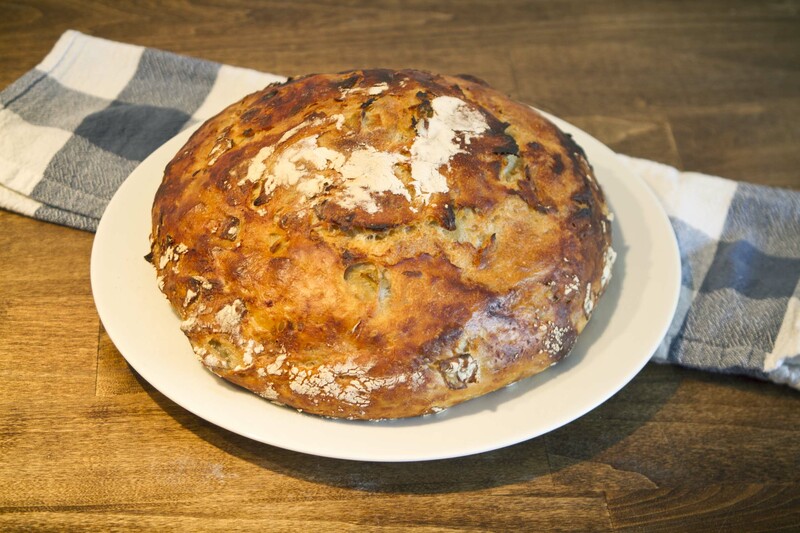 I love artichokes and roasted garlic, so I will definitely try this bread. I learned the steam trick earlier this year during Vegan MOFO when I made some crusty bread for my Game of Thrones theme. Hope you enjoy it if you try it out! One if the reasons I like making sauerkraut is the limited Prep time – I don’t mind waiting for things if I can do other things at the same time! Looks great! Congratulations on winning Best Bread at this VVP! !